Short overview for all available Raventeam mods. Links to the individual pages for all available Raventeam modules (and Tutorials). The RavenTeam is a modding team, even if there is only the Raven-part doing all the work alone at the moment. So the old Hexenmeister is creating a module (or mod in short form) for a game from time to time. Mostly these modules are complete adventures which can be played within the main game. While modding also means that one just changes a single file or a single graphic, this is not what I do, Raventeam mods are always a complete adventure for a game and with a few hours playtime. Normally my mods are made with a so-called Toolset. Games like The Witcher or Dragon Age normally come with a SDK or some kind of Toolset, where you can create those modules with, strategy games like Fantasy Wars or Heroes of Might & Magic are coming with a Map Editor. 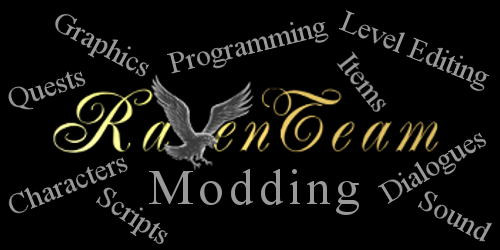 However, all the mods and games that the Raventeam has created (or will create in the future) can be found here with a short description and there are also links to the full description, downloads, screenshots etc. for every mod. The module Evil Decision was submitted for the D'Jinni Modding Contest that CDPR started early in 2008. It was the only non-Polish module to receive what CDPR chose to call an honorable mention, that means it was ranked third, since CDPR decided to award only a first prize and only mention the second and third placed mods. Evil Decision was developed by the RavenTeam and is playable in both English and German. What's wrong in Ban Glean, so wrong that Eskel got drunk rather than face it? Geralt has received a message from Eskel, asking him to take over a contract that Eskel claims to be unable fulfill himself. But when Geralt arrives in the village of Ban Glean, he finds that Eskel is still there and apparently healthy, if a bit drunk. Geralt sets out to learn about the contract he's expected to fulfill and more importantly, what's going on in the village that could upset even an experienced Witcher. Forget that I said, I'll always make complete Adventures, sometimes even I get annoyed by the small things in my (gamer-)life, just like in Starbound. And sometimes it may happen that I even write a small modding-tutorial, if I see that several people asking for this. But tutorials like this one are no real mods, I only show how to change data and what you need to be aware of. Just as in this small Starbound tutorial which changes the hunger bar and also the food rotting. You can find the link to the full article in the lower side bar under "related articles".